There are a number of interesting MOB recovery systems in the world, such as the Sea Scoopa. However, many of them are unsuitable for prairie sailors like me. I need either a method that works with the kind of equipment that is standard on every charter boat, or a system that is compact and light enough to throw in my suitcase. If I ever get to the place where I own a vessel, then my options for MOB recovery equipment open up a bit. But for now, the methods below seem the most practical. Note: I am omitting from this discussion all methods that might involve removing a hypothermic individual from the water in a vertical position. The reasons for that have to do with circum-rescue collapse, which is discussed on the Home/Hypothermia page. If water conditions are calm, and the MOB is still fit enough, then the simple method is the easiest: the casualty comes around to the stern and climbs up the swimming ladder. However, if there is significant wave action, any pounding of the stern could pose a lethal risk to a person in the water near the stern. 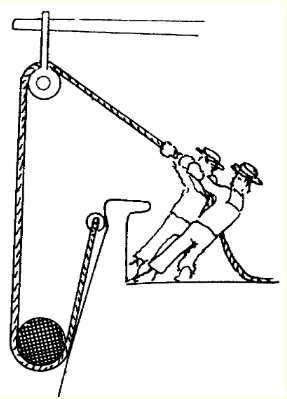 A better method to use if the MOB is still fit enough to assist in his own recovery is the elevator method, rigging a line from a cleat to a sheet winch, leaving a bight down into the water. The MOB steps onto the line, and the crew onboard winch him up until he can step onto the deck. And by-the-by, notice how much freeboard this yacht has. Nobody, but nobody, is going to just lie down on deck and grab a passing MOB by the collar. Your boat-recovery strategy has got to be something that goes beyond "drag the casualty back on board" as you see in this video. Now, if we want to learn to tack efficiently, we don't just read about it in a book or look at pictures on the web. We practice it ourselves. This is, or should be, doubly true with man overboard recovery. So during our January 2015 trip to the British Virgin Islands, we decided to test various ideas about MOB. We all practised getting into the boat by the elevator method...and it worked pretty well! One method that did NOT work was the "brute force" method of just hauling the person up onto the swim platform or into the dinghy. 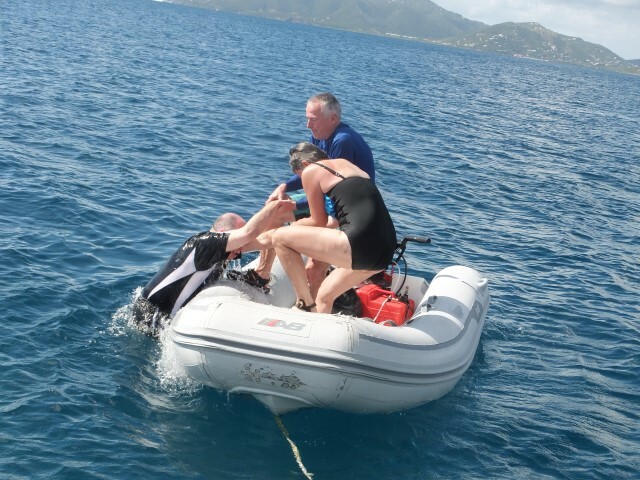 In our case the swim platform was a little small for two rescuers and one casualty to share, so two of my crew tried to haul me into the dinghy. I was not, by the way, trying to simulate unconsciousness. Even with me kicking like crazy, they couldn't get me out of the water. 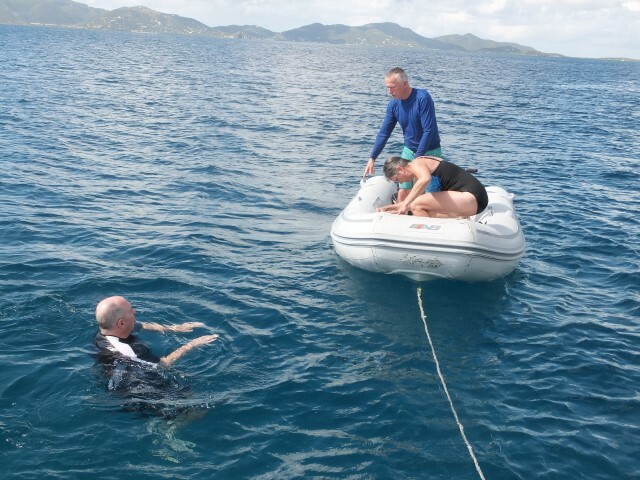 Once I got back home to Canada, it occurred to me that if we had found the valve to let the dinghy partially deflate, my crew may have been able to recover me. But frankly, this is not a technique we would have wanted to experiment with anyway. We liked having a fully-inflated dinghy to use to get ashore. 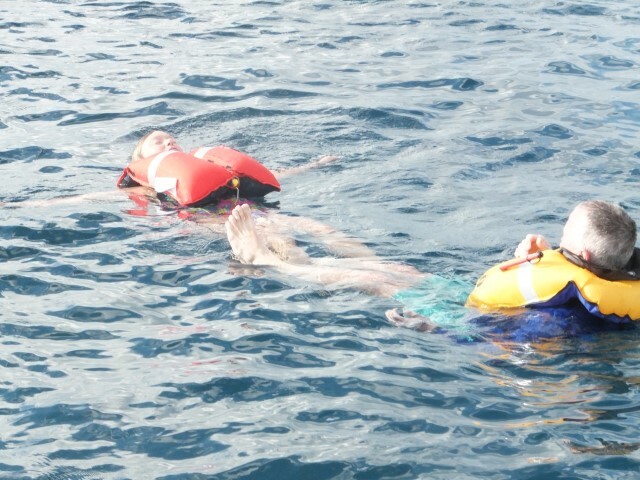 As Jesus (almost) said, "There is more to a sailing vacation than man-overboard drills." In the event of an actual MOB emergency, one could perhaps look for the valve...or just stick his knife into the dinghy. You would eventually have the dinghy sink...but better that than to lose a person's life. 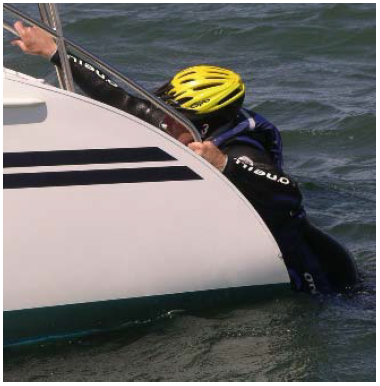 However, the "brute force" method, even if you can manage it with your dinghy, needs to be very gentle with the person. We must not trigger the movement of cold, acidic, CO2-laidened blood from his extremities back into his core while we are getting him out of the water. If you are in the tropics, however (as we were when these photos were taken), drowning - and possibly sharks - are your only hazards. You just want to get him out of the water any way you can, as quickly as you can. It is one of the unpleasant little ironies of sailing that when you get far enough south that you no longer have to worry about hypothermia, you must start to consider sharks. One of the resources you need to be aware of is the 2005 Crew Overboard Rescue Symposium.pdf document. 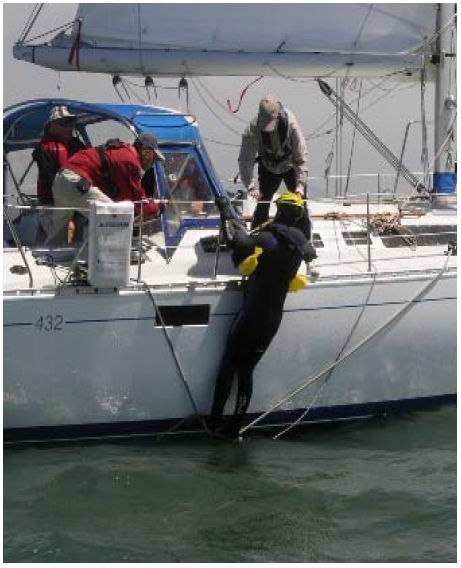 A broad array of sailors got together in San Francisco Bay back in 2005 to actually test various theories of boat-handling as well as casualty-recovery. It is impossible to overstress how important this event has been to us over the past decade. There are so many who theorize about MOB recovery (I will not mention any by name, but Sail Canada comes to mind), who say "Do such-and-such" without ever trying it for themselves to discover that the technique taught will simply not work. Those of us who are serious about boating safety need to adopt the motto of the Royal Society: 'Nullius in verba' which is translated as 'take nobody's word for it'. So download this document and digest it. It has only one weakness: it is 10 years old. It does not take into account the "aha!" moment which has led to the "heave-to, sail-to, heave-to" technique of boat handling. Nor were they fully cognizant of all we have come to understand recently about hypothermia. That said, this is a must-read document. The word "parbuckle" is very uncommon in modern English, but it IS the word used to describe rolling something (like a barrel) up an incline (like the hull of a ship). There is no other word available in English to desribe this. The 2005 Symposium document does mention the possibility of using a parbuckle net...though the net pictured here seems to be unavailable commercially. Likely, it is homemade...as up until very recently, there were no commercially made parbuckle nets available. Parbuckling a casualty up the side of your vessel has two enormous advantages. First, it works even with a wholly unconscious or critically hypothermic casualty. Second, it keeps the casualty horizontal, thereby reducing the risk of circum-rescue cardiac collapse. 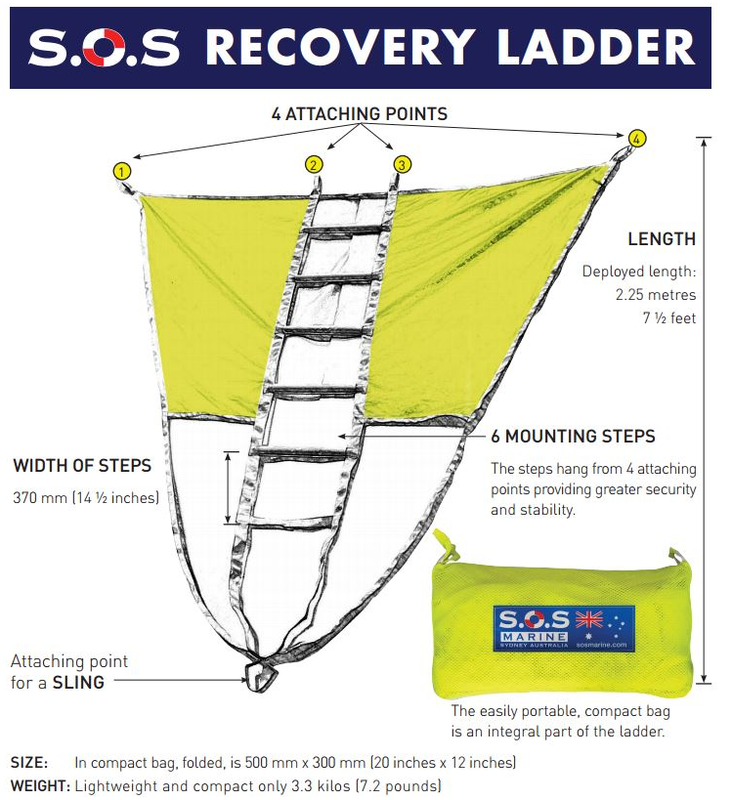 Unless you plan to make your own parbuckle net from parachute cord, the very best option is the SOS Recovery Ladder, from SOS Marine in Australia. It is available in Canada from ca.Binnacle.com of Halifax. The cost of the SOS Ladder is not dramatically more than what I spent tying my own parbuckle net out of parachute cord...and it is a much more professional piece of equipment in the end. A further benefit is that at 7.2 pounds, it is small enough to throw in your suitcase if you are like me: a prairie sailor who always flys somewhere to charter a boat. It is lighter weight and smaller than a comparable home-made recovery net tied from parachute cord. If your MOB is fit and conscious enough to use it, this can be used as a ladder. And in this capacity, you might find it helpful even if NOT an MOB casualty. Some sailboats you charter come with no swim platform at the stern, and no convenient way to reboard if you decide to go for a swim. 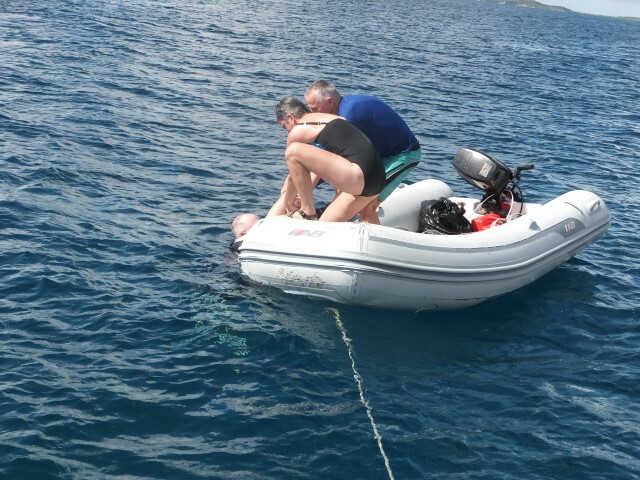 But if you do have an unconscious or hypothermic casualty who cannot assist in their own recovery, you can affix a halyard to the peak of the recovery net, maneuver your casualty into the bight of the net, and then just roll them up the side of the vessel. When they get up near deck level, you can wrestle them aboard. If they have a PFD on, it may be a little challenging to get them in under the lifelines...but at the very least, while you are doing this, they are in no danger at all of drowning, and their risk of serious injury due to hypothermia is dramatically reduced. If your casualty is seriously hypothermic, and you expect Coast Guard assistance within 20 minutes, you might keep the casualty in the cockpit. If it will be some time before you expect assistance, you will want to get the casualty down into the cabin to begin warming them up. Because of what you know about hypothermia, you know that if the casualty is able to walk, you can let them do so...but slowly, and for only a moment to get down the companion way stairs. Then they should lie down again. You don't want them upright and active until they have warmed up a bit. If they are mostly conscious, you can give the person a warm beverage to help warm them up from the inside out. Not TOO warm. The casualty will be less able than normal to recognize that something is so warm it must be sipped carefully to avoid scalding the throat on the way down. You should try a sip whatever you plan to serve before handing it to the casualty, to ensure the temperature is right. If he is mostly unconscious, wrap him in a sleeping bag. But before you do this, wrap him in a plastic tarp - if you have one - to serve as a vapor barrier to protect against further evaporative cooling, and to keep the sleeping bag dry. A dry sleeping bag, of course, has much better insulating qualities than one that is wet. 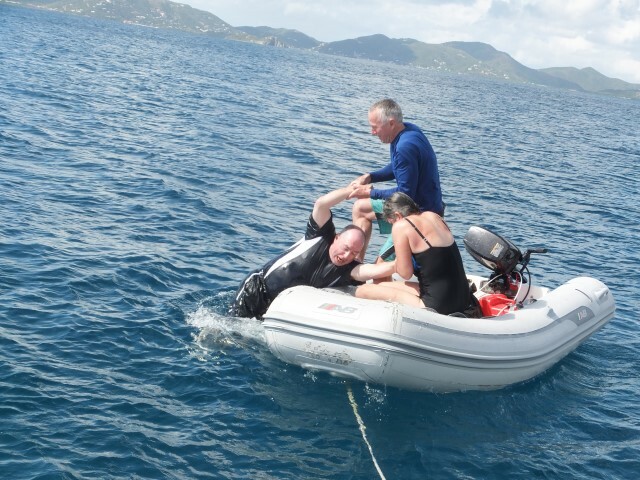 When we were practicing all our various MOB boat-handling and recovery strategies while sailing in the British Virgin Islands, we found an unexpected problem. With a Mustang inflatable PFD, there is no place that you can snag with a boathook. That is, even after you have skillfully brought the boat up beside the casualty and reduced the boatspeed to 0.0 knots, you are STILL going to have to maneuver the casualty into the bight of your recovery net. And there is simply no way to DO that. We tried! In our case, we were experimenting with fully conscious "victims" who were having a lovely time in the tropical waters of the Virgin Islands. But if they had been unconscious, and we needed to rescue them, we would have had a serious problem...given our general objective of not putting yet another person down in or very near the water. If you have an inflatable PFD, you already know that rearming kits are a bit expensive. You hate to spend $75 just to find out if a particular rescue idea will work or not. But the PFD is no damn good if you spend hundreds of dollars on a it, only to die of cardiac arrest because nobody could get you out of the water in the timely fashion. - see if it is "snag-able" by a boathook. Perhaps if we can rig a crotch strap to help keep the PFD from riding up over the casualty's face, it might give a place to snag with a boathook. The short version: "We don't give a rip." The long version: I emailed the design guys at Mustang after this trip, to ask if they could incorporate a loop behind the head that we could catch with a boathook...much as lifejackets for dogs and children already have. Their general position is that it is THEIR job to make sure you don't drown. If you die of cardiac arrest, that is YOUR problem so long their PFD is holding your face out of the water.